Oil Painting Medic: How can I Enjoy Still Life Oil Painting without Odours or Mess? Producing still life art in oils may give the impression that a separate room, shed or studio with ambient lighting must be allocated to quarantine all the mess, odours and creative processes from the rest of the house. Further, a storeroom full of wild and exotic objects must also be a requisite for great still life art. But this need not be the case. 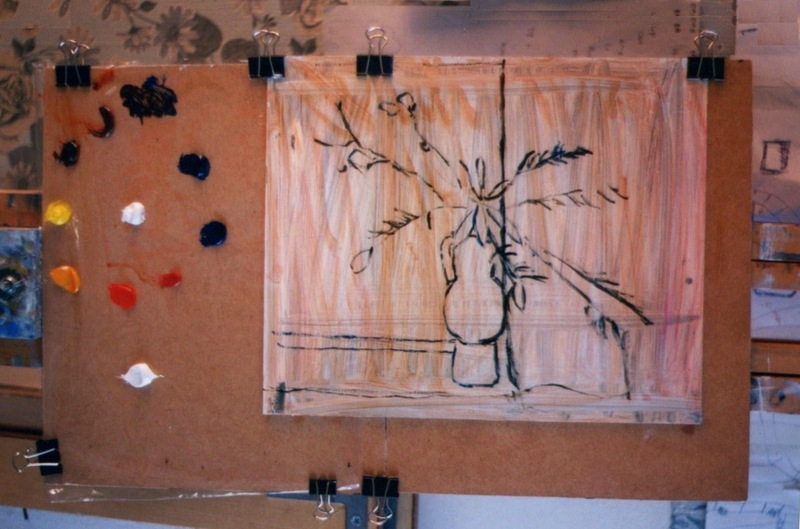 I have found that with the right planning, still life painting can be practiced in a study, a bedroom, corner of a living room or even the garden. Simple objects and minimal art equipment is often all that is required. But where should the artist begin? The still life artist is spoilt for choice when it comes to modern innovations in oil paint, designed to make it easier for painting in any situation. Low odour artist thinners, for example make high odours in a confined space a thing of the past. Sandador, Turpenoid or artist spirits, for example are kinder to the environment, the brushes and the olfactory senses. The artist may alternatively opt for water-soluble oils, such as Artisan, which can be thinned with water instead of spirits for glazing (or washes). Artisan provides a water-mixable counterpart to all the traditional oil painting materials, including linseed oil and impasto medium. At the end of the session, the paints need only be cleaned in warm soapy water rather than spirits. Producing large still life as did Matisse and Cezanne is an immensely satisfying experience, as this allows expressive and loose brushwork. However, not all households have the facilities to permit the production of, or the storage of such large artwork, in which case, the artist may purchase, artboards, stretched canvases or oil painting pads in handy sizes from stationers or hobby shops. Dimensions are usually in imperial, and which will fit standard picture frames. Anything from 8”X 10” (203mm X 254mm) to 16”X 20” (406mm X 508mm) are ideal for quick still life sketches or paintings to spice any living room wall. Cleaning up the art equipment at the end of a painting session need not be a messy business if the artist uses a disposable palette. Simply stretch some cling film over a stiff surface via bulldog clips and affix onto a backing board along with the painting. This will keep the artist’s hands free for the painting. The cling film can be folded inwards and disposed of cleanly. Alternatively, the palette can be covered with a Tupperware lid and kept in a cool place. The oil paints will remain workable for up to three days or so. The painting or backing board can be affixed onto a lightweight easel or tabletop easel, which provides an angled support for the painting. Some easels come with storage compartments for the art materials. The artist will surprised at how much can be stored in a small space, which could also be a tool box or art bin, ideal for the still life artist’s compact studio. The still life setting needs only a stable surface and a good light source. Natural light from an adjacent kitchen window onto a tabletop cannot be beaten, but a mobile desk lamp or candles grants the artist complete control over where to place the light in relation to the objects. Blutac or small pieces of sticky putty can be used to affix unstable objects, such as spherical fruit onto the tabletop when arranging the composition. But the artist need not purchase everything mentioned to begin still life painting. I have often completed oil studies by the use of two brushes, three colours, a small canvas and no mediums. The artist may purchase additional materials as to requirement or to achieve a particular effect. This means still life oil painting remains a realistic pursuit regardless of the funds, storage capacity available and can be practiced cleanly.